Rain World is ranked in the 31st percentile of games scored on OpenCritic. Throughout it you can see the hard work that the team put in. From the weird physics engine to the character designs, and all the way to the pixel art, the game comes across as a labor of love. But somewhere it lost touch and decided to focus more on aesthetic than on the actual game design and gameplay. The game gives me a sense of defeat because there's such a beautiful and fun world that has been held down with the cumbersome controls and overbearing difficulty. Rain World is a game that will end up breaking you emotionally, not because the main character is cute and dies every five seconds, but because game forces you to submit to its rules without any form of consent. Rain World isn't a game that everyone will enjoy unfortunately, and that is a shame. Rain World is brutally gorgeous and an unforgiving world that continues to amaze and throw surprises at you along your journey. Hauntingly beautiful and challenging. Rain World is more than a platformer, it transports the player to a fully fleshed out ecosystem in which he must play by its rules to survive. Not since Mark of the Ninja have I played a stealth game that felt so impactful, lingering in my thoughts long after I put the controller down. While this game is a port to Nintendo's hybrid console, it has seen some major improvements to controls, balancing and even added features, such as new modes to play as and a local multiplayer option, which definitely adds to the experience of playing on the Nintendo Switch when compared to other consoles. Rain World is a challenging experience, to say the least. If you are looking for a new game to really test your skills, a game with little to hand-holding and lots of exploring or a game that has a little of all your favorite genres, you have to give this game a try. However, do keep in mind that the difficulty can be a bit stressful at times, making you leave the game to cool off for an hour or two… or maybe a few days before you're ready to try and take another stab at it. Rain World is an incredible adventure and rewards persistence while being an extremely aesthetically pleasing game. Paying homage to older games with its design, it still feels like its own entity. To me, this is nostalgia done right. Taking everything into perspective, I found Rain World to be an absolute gem. There's not much of an explicit story, yet the world is spelled out all around you with your experiences in this ecosystem personalizing each encounter. The difficulty can be a nice throwback however, the fact that your progress can be so easily lost is going to be a 'make or break' point for most gamers. If that's something you can't deal with, I strongly emphasize my caution to you to stay away. For those who do choose to press on, you're in for an incredible journey through a world that's truly unique every time through. Think Limbo, but more haunting and with better controls, and you'll have a basic idea of what Rain World is about. Among this year's many exciting triple-A games, Rain World holds its own for being original, exciting, and addictive. This beautifully animated indie title keeps players on their toes by facing them with threatening creatures, each with varied tactics, and imminent storms. Mechanics can be mildly frustrating at times, but there is certainly a learning curve. All in all, Rain World is delightfully weird and should not be overlooked. While working on my own review, I knew that the game received a lot of bad reviews. I did not want to read other reviews because I didn’t want my review to be influenced by others. Most people hate what they cannot understand. But for me, you can’t just hate a game simply because it’s difficult (what about Dark Souls?). When you’re playing to have fun, you need to give Rain World plenty of time to get the best out of it. Rain World might suffer from poor controls, challenging difficulty level, and some bad gameplay mechanics, but if you are patient enough, you'll enjoy it. Rain World manages to create a big, scary world for you to navigate but it doesn’t really put much in that world besides its visuals. You’re not given much instruction, and after a while it can feel boring and frustrating to get through. The game does offer quite the challenge, but with no real reward or sense of progression, it’s not a challenge you’ll feel like taking on. Despite my grievances with the unfair difficulty of Rain World I did enjoy my time with it but not as much I had hoped to. It's massive, interestingly, designed world begs me to explore it but the unfairness of it all pushes me away. Rain World has so many things going for it like an awesome enemy AI system, great animation, huge world and more but the other lesser done well things like the way too slow movement speed and the moments of unfairness keep it from being truly great. I do think it is worth checking out though and judging for yourself as it is unlike most other games out there. Sticks and stones may break my bones and the rain will totally kill me. Like every other thing in Rain World. If you are up to some challenging puzzle-platformer with extreme survivor elements, Rain World is what you are looking for. 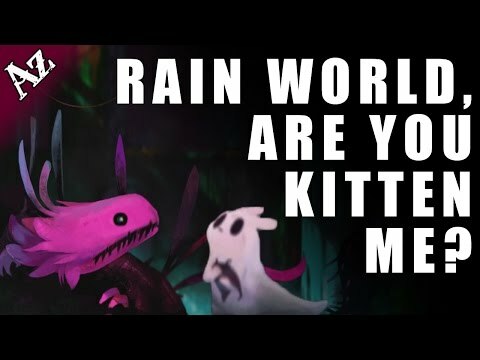 Rain World is certainly one of those “love it or hate it” type of release where the premise is either going to strongly resonate with you, or you’re going to abhor it and not want to play it again. The game’s presentation is top-notch, and its gameplay mechanics feel tight and to the point, but this might not be enough so save it in your eyes. Did I have fun with it? Yes. Is it a flawed release that could have been made a tad less difficult? Definitely. Is this a must-have game on PS4? Hard to say. But I’m sure that if you play the game you won’t forget about it anytime soon. I wanted to love Rain World. It’s an admirable game that tries many interesting things, but it also puts up too many barriers that deter gamers from truly enjoying it. There’s an interesting world to explore, but most will lack the patience to do so. Rain World is a surprising fun game when it manages to click together. However, it also suffers from some frustrating design choices that makes it difficult to enjoy the game. Despite its flaws, the game offers a solid experience if you can overlook some of the difficulty spikes. Rain World is difficult and unrewarding unless you’re willing to persevere through unforgiving trials of time and sheer luck, then you’ll likely find a plain frustrating experience. That said, those who don’t waver are bound to find a gem within the rough. Do not be fooled by the serene music or a cute protagonist, Rain World is an extremely difficult and highly frustrating survival game. You will become part of the food chain from a hostile environment with deadly rains. Death will constantly follow your steps and progression will have a slow pace. Several secrets await to be uncovered, including game's own mechanics and objectives. If all of this enticed your competitive spirit, go for it; buy the game and be happy. Otherwise, stay away from all the stress. Above all, have in mind that you may face technical problems that may corrupt your save file. 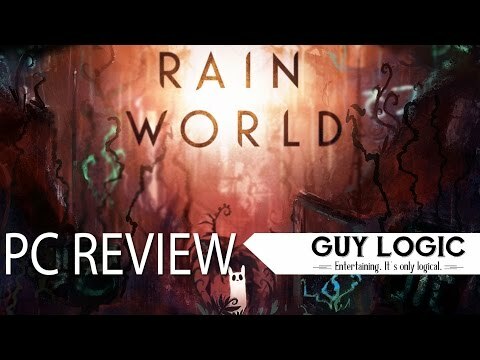 In short, we can say that Rain World offers a platform adventure that also introduces some aspects of survival; However, if the game offers good ground on the card, in the realization we encircle some aspects that do not convince us too much. Rain World is a charming and beautiful game held back by its overly punishing gameplay. Imprecise controls and cheap deaths contribute in making this survival platformer way more frustrating than it needs to be. I wanted to love Rain World, I really did, but in the end I couldn’t. Although it starts out strong, and boasts a variety of unique gameplay features, it ends up coming out a bit muddled due to the abusive limits it places on players and overbearing confusion. Rain World has so much potential, it's infuriating to watch it crumble under the weight of trying to be difficult. There seems to be a new mantra in gaming that the game's not good unless it's brutally hard, and this is clearly misguided. If it controlled better and gave the player a bit more sympathy, Rain World would have been sublime. As it stands, though, Rain World is just an angry experience, yelling at gamers for every little mistake. Developer Videocult took a brave chance with Rain World.